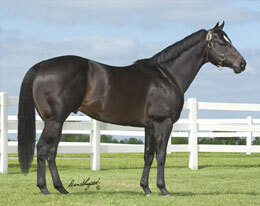 Ivory James is a multiple stakes sire with earners of more than $13.1 million. WAYNE, OK�AUGUST 9, 2017�Royal Vista Equine's IVORY JAMES had a number of stakes competitors over the past weekend. Marfilmio, a colt by IVORY JAMES from the Mr Jess Perry mare Sinuous, finished second in the $52,600 NCQHRA Futurity at Canterbury Park. David and Debra Harsche own the gray colt bred in Texas by Bobby D. Cox. Victor Hanson trains with Ismael Ricardo riding. Ralph Denard and Carrie Suitors' Stole An Encore qualified for the $18,500-added Evergreen Park Juvenile Challenge. Laura Ferguson trains and Martin Ortiz had the riding call. Vaugn and Jill Cook bred the IVORY JAMES filly in Oklahoma from the Rare Form mare Rare Encore. Cm Once Ina Bluemoon, a gelding by IVORY JAMES out of Cool Blue Corona by Jess Louisiana Blue, qualified to the $10,000-added Oneida County Futurity. Randy Dickerson is the owner/breeder and Garth Blattner trais. Kyle Schoonover was the qualifying jockey. The trio of Dickerson, Blattner and Schoonover also teamed with Cm Partners In Crime, an IVORY JAMES filly from the Strawfly Special mare Im Special Star, to qualify for the $2,500-added Oneida County All Breeds Derby. IVORY JAMES is a multiple stakes sire of more than $13.1 million in earners with average earnings per starter of more than $18,700. He has sired 14% stakes horses from starters. Owned by Bobby Cox and Sylvia Shaw Pitman, IVORY JAMES stood for a $4,000 fee in 2017.